I've been hopping in and out of #AMonthofFaves this month with some book-related and not-so-book-related content. Today's prompt: Year-End Updates on Reading Challenges, Resolutions and Goals. 2015 TBR Challenge: Miserable fail. Though I read plenty of books that technically were on my TBR pile before 2015, only of them were on my official TBR challenge list. In many ways, I think that the reason the Read Harder Challenge was a success for me was because of the diversity of categories--and because that diversity both pushed me to try new genres and new types of books while allowing me to count many books I would have read otherwise. 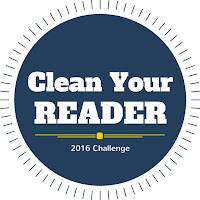 It combined with my review commitments and overlapped with other challenges very organically--and because it was both challenging and fun, I'll be participating again next year in the 2016 Read Harder Challenge (this time with new categories!). Besides that, I'm focusing next year entirely on free-form reading challenges: Andi's #ReadMyOwnDamnBooks challenge, my own #CleanYourReader e-book reading challenge, and the continuation of the Classics Club. Challenges that require a specific list of titles to be set in advance, I've learned, just do. not. work for me (even when I set that list myself). Are you participating in any reading challenges next year? What are your reading goals?